When I started brewing I had no idea what I was doing. I read a lot of "stuff", much of it contradictory (or simply wrong) and much of it I didn't understand. I started brewing, got over excited, made a beer with carob, and cinnamon, and anise (and 58% efficiency, because I REALLY didn't know what I was doing.) And basically made all the typical mistakes that a new, overly excited homebrewer makes. But I learned, and I got better. And one of the major reasons for that is that I have a strong community of brewers in this country who welcome new brewers into their ranks and help them. There's a long list of people I can thank for my advancement this past year, including Dagan Bar-Ilan, who gave me access to his homebrew forum even though I didn't quite "qualify", Noa'am Shalev, who spent several hours talking me through my first BIAB batches (before I had a mashtun), Shahar Klien, who gave me me first taste of liquid yeast (and a lot of good advice), Shahar Hertz, my "dealer" in homebrew goods until he closed shop, and many many others. One thing I remember particularly about Emanuel is his first post to the brewing forum after last year's Longshot competition. He won first prize, I believe in the wheat beer category and, true to his promise from before the competition, he posted the winning recipe online. He got a fair amount of crap for that, and people were telling him that he should keep the recipe for himself so he can win the next year. But he said that it's the brewer that makes the beer, and that the purpose of the forum is to make us all better brewers. So he published the recipe. And you know what? 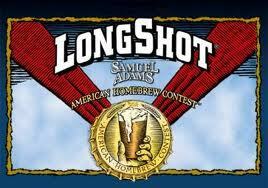 Last night, at this year's Longshot, he took first for wheat again. - I have a small mash tun, so I couldn't add much water for mash-out, and obviously adding 360ml of water wasn't going to bring the mash to 77C, so instead I did a 2L THIN mash decoction to bring the temp up. You don't necessarily have to do this, it's just something that helps with batch sparging.